While all eyes are on the tottering behemoth Infrastructure Leasing & Financial Services (IL&FS) and its hundreds of hydra-headed subsidiaries, more and more details are coming out of the ingenious and crafty devices by which a handful of senior managers had arranged to give themselves hundreds of crores of rupees in perks and windfall gains and got contracts and employment for their relatives. One such device is the Employee Welfare Trust (EWT), which holds a 12% stake in IL&FS, making it the fourth largest shareholder of the unlisted entity. At its peak, this small group of privileged managers running the IL&FS group had lined up a massive pay-off through their holding in the IL&FS EWT. Calculated at its peak reported valuation in 2010, says GD Agarwal of REDD Intelligence, a boutique market intelligence agency, the windfall would have amounted to over Rs1,650 crore. This valuation would have only increased significantly, given that the group grew exponentially, if recklessly, over the next eight years. But the game is over now and so is this planned bonanza. In 2006, there was a preferential allotment to the EWT of 53 lakh shares at Rs91 each. In June 2006, IL&FS also signed an agreement to sell the shares to ADAI (Abu Dhabi Investment Authority) at Rs275, compounded at 17%pa (per annum). More about this later. When asked by The Mint, a company spokesperson was defensive about this potential ‘windfall’ and had argued that, unlike technology company executives, who got stock options, “We sell a portion of the stake in the employee trust to reward employees.” There is very little information in the public domain about this trust. The red herring prospectus (RHP) of IL&FS Transportation Network Ltd, (ITNL) in March 2010, revealed that the EWT was allotted 15 million shares at Rs10 each on 29 September 2006. In less than three years, it sold 4.13 million shares to Bessemer India Capital Holdings II for Rs242 per share. In effect, just Rs15 crore invested in September 2006 had turned into a massive profit of Rs 363 crore in under three years, Mr Agarwal points out. What is intriguing here is that the share allotment was not to ITNL’s employees but to the EWT of IL&FS, an unlisted holding company which has just 134 permanent employees. More importantly, data from elsewhere suggest that there are only 10 major beneficiaries of the trust, who could be the cabal close to Ravi Parthasarathy; but the details are not known. Extraordinarily, a former employee of IL&FS insists that all employees of the group were part of the EWT. However, none of them, including those at senior levels in the company, had any knowledge of about the allocation of shares to each employee or how they were valued. He is also emphatic that the clause about 10 Specified Beneficiaries in the document referred to above was to protect ADIA’s interest. This is borne out by a paragraph which says: “EWT shall not and it shall ensure that the Specified Beneficiaries shall not, participate in any structuring designed primarily to avoid or in any manner vitiate the rights of ADIA and/or the Affiliate Shareholders as contained in Article 208”. It goes on to say that EWT “shall not transfer or distribute the legal or Beneficial Ownership of or interest in any equity shares to any Specified Beneficiaries” unless they have “first entered into a direct covenant in favour of ADIA” and agree to be bound by the rights of ADIA contained in the article above. Since there is no information about how EWT or its trustees and IL&FS has not been answering media queries, we have no way of verifying any of this. 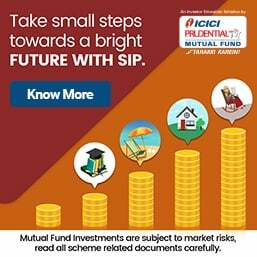 While we, in the media, have been focused on the fat salary of Rs26.3 crore that Mr Parthasarathy snagged in FY17-18, even as his 30-year ship was sinking, this pales into insignificance compared with the potential payoff that management and select employees would have received through the EWT. Now that IL&FS has run out of borrowing options and collapsed due to the massive asset-liability mismatch, the value of these shares would be meagre. Given the personal incentives involved through the EWT, it is no wonder that IL&FS kept paying dividends even when the ship was tilting. The board, led by Uday Kotak, which is meeting today, and the Serious Frauds Investigation Office (SFIO) need to investigate EWT and its activities. Another important finding, through those who have dealt with IL&FS companies, is that the EWT and salaries were not the only vehicle for personal enrichment of top executives and favoured employees. We have details, so far, of at least four of the top 10 executives at IL&FS having employed their children or sons-in-law in lucrative positions within the group with better than normal salaries and benefits. Ravi Parthasarathy’s daughter, Rhea Parthasarathy, is employed at IL&FS. Her salary is listed in the FY16-17 annual report. There is no disclosure in the latest report, although sources say she continues to work there. But this is the least significant. The son-in-law of K Ramachand is employed by the group at Dubai. Contracts to handle the interiors of the IL&FS building, running into crores of rupees, were handled by Mr Ramchand’s wife. There is now a lookout notice against him. Similarly, another top executive’s son runs a construction business that works for IL&FS. The extraction of value from cars purchased for the company’s car-pool is another story that is known to all key employees but will have to be examined by the SFIO. Informed sources also say that the lavish expenses, including luxury holidays for families, were organised and paid through foreign subsidiaries, including the one in Spain. A letter from an insider speaks of the extravagant salaries and performance benefits paid out to former secretaries, promoted to head administration, but who seem to be rewarded more for the personal work done for senior managers. What makes the analysis of the sordid state of IL&FS’s finances difficult is that disclosures are poor and, probably, falsified as well—although auditors across the group pocketed large fees. The newly appointed IL&FS board held its second meeting last week. Hopefully, the board can throw light on how it plans to deal the crisis. IL&FS has a hole of almost Rs30,000 crore in its balance sheet. Will it still attempt a bailout and postpone the problem, or will it manage to find buyers for the many viable subsidiaries, even if it is with a haircut? Those who are watching the situation would like to see whether Mr Kotak, who headed a corporate governance committee last year appointed by the market regulator, manages to fix any personal accountability. After all, the IL&FS mess was caused by the top management, which ran the group as its personal fief. In a detailed analysis released on 15th October, REDD Intelligence has put out a more detailed analysis of the operations of IL&FS Employee Welfare Trust. IL&FS has 130 employees as per the FY2018 annual report, and looking at the holdings of IL&FS Employee Welfare Trust (IL&FS EWT), an investment vehicle for employees, each member should be at least a millionaire. The total value of its holdings in four IL&FS companies was an estimated Rs25.8 billion ($350 million). The latest addition is an unknown stake in Earth Environment Management Services Ltd after an Rs1.88 billion ($25.5 million) loan write off by IL&FS Financial Services Ltd.
IL&FS EWT owned 17.8 million shares (including 2.5 million shares it monetized) in IL&FS, as per company filings. These shares at the last rights offer price in September 2014 of Rs750 per share were worth Rs13.35 billion ($181 million; rights offers are generally at a discount to market value). If one were to use the Rs1,099 per share that Bay Capital paid to buy IL&FS shares as per a July 2010 Mint report, then the value of these holding was Rs19.56 billion ($265.2 million). It is estimated that IL&FS EWT sold 2.5 million shares between September 2009 and March 2012 according to company filings. HDFC Bank also sold 1.62 million of 14.05 million shares it held in IL&FS in FY2011. These sales may be the last successful monetization of stakes in IL&FS before the company's fall from grace. IL&FS EWT also entered into a share purchase agreement in June 2006 to sell shares to Abu Dhabi Investment Authority (ADIA) at Rs275 per share. Despite the deal, it is surprising the board approved the issuance of 5.4 million shares to the IL&FS EWT at Rs85 per share, a price that was even lower than the share issuance price of Rs90 per share 18 years ago. The 5.4 million share issue looks like a sweet deal for IL&FS EWT given that IL&FS issued 19.6 million shares in September 1994 at Rs90 per share and another 18.8 million shares in December 2001 at Rs60 per share. About 10.3 million shares under a rights issue were also issued in September 2014 at Rs750 per share. Another interesting deal involves IL&FS Transportation (ITNL). IL&FS EWT subscribed 15 million shares of IL&FS Transportation at Rs10 per share on 29 September 2006, the same day it allotted 76 million shares to parent IL&FS at Rs45 per share. Just three months later it issued 4.16 million shares to Trinity Capital at Rs100 per share. Within three years, IL&FS EWT sold 4.3 million shares in ITNL to Bessemer's India Fund for Rs242 per share, a whopping 24.2 times gain. With IL&FS EWT the beneficiary of what seem to be favorable deals, the immediate question is how many beneficiaries are there at IL&FS EWT? Are they the 130 employees of IL&FS parent or does it also include employees from subsidiaries? The share purchase agreement for the June 2006 deal between IL&FS EWT and ADIA referred to 10 specified beneficiaries, as per the share purchase agreement. However, in the absence of other information about IL&FS EWT, it is difficult to come to any solid conclusions, just more questions. Credit rating institutions should be asked to explain for the ways they rated the corporate sector that took the financial system into deluge. RBI and SEBI should constitute a Committee to look into the rating mechanism and review the rating institution recognition process. Is even one person from ILFS anywhere near a lock-up or a jail? Hari Sankaran's sister Deepa Sankaran was employed at a very senior level even though she had no experience in this business. She later used the IL&FS job as a stepping stone to other lucrative jobs. It is clear that ILFS was being run by a group of gangsters and hoodlums and worse the Board kept quiet all these years. Perhaps they are again a bunch of thieves who were getting their own share of kickbacks. All these guys should be imprisoned immediately with no bail to be provided. Immediate task would be get back to India the chief looter and scamster Ravi Parthasarathi back to India. Like other Indian politicians he has taken the easy way out by getting himself admitted to hospital. Government must arrange for his immediate discharge from London hospital and getting him admitted to a prison hospital in India in case he needs any medical treatment. It is incredible that ILFS creates 300 subsidiary companies and still the lenders do not find it odd. At least the SBI under Arundhati Bhattacharya and earlier, who was one of the major lenders that too several of these Companies. One study the new Management MUST make and publish that how many of these 300 companies were financed by each major Bank when it was obvious that all these Companies are just offshoots. All were dealing with "Other people's money". Huge moral hazard and agency problem which was never fixed. People should be pulled out of retirement and jailed. The one and simplest question is are we going to punish anybody, or are we going to use the new Board to just brush the rot under the carpet ? It's time we recognise crime for what it is, white collar or blue collar and take severe deterrent action. Otherwise, ILFS type incidents will repeat themselves with depressing regularity. 2. Granted that the investor before investing would look at the value of projects in hand, which is not captured in historical accounts, but for an astronomical Rs. 1,099 per share around the year 2010 is not credible going by the above figures and lack of any credentials of IL&FS even at that time. In FY-2010, while the PAT had zoomed to Rs. 3444 million (from Rs. 263 million in FY-2010), it was entirely stuck in receivables including “toll receivables” aggregating Rs. 4731 million. So the FY-2010 figures could not have justified astronomical valuations. 3. How could Bay’s Capital invest in the company at Rs. 242/share of face value of Rs. ten in 2009 with such modest performance? Was there a guarantee for attractive exit? Such possibility becomes evident when we see figures for FY-2014 and 2015 i.e. when Bays Capital exited. The figures below show that by 2014 itself INL was crumbling under debt-to-EBITDA ratio of 9.27. The company’s debt increased by 14.5% in FY-2015, and thereafter it was its incessant race to debt! No institutional investors would invest in such company at such outlandish valuations, and there seems to have been quid-pro-quo between these investors and ITNL. These investors enriched the IL&FS folks through trusts and, the institutional investors presumably got decent exit at the cost of Indian investors – individual and institutional. Whose money was used by these institutional investors? The accounts seem to have been doctored to assure Bays Capital of its profitable exit provided it would enrich the so called employee trust in 2009. This seems to be a fit case for SEBI investigation for duping general investors barring the select ones! Action on ITNL has to go beyond accounting and financial audit. It has to be subjected to FINANCIAL MANAGEMENT AUDIT and investigation by SEBI to unearth the modus operandi of the group to enrich a few at the cost of others through dubious means! A fundamental analysis with peer comparison will show that ITNL was the worst of the lot. An institution which should have set standards for efficient project formulations and corporate governance turns out to be akin to a group of hyenas mercilessly biting away a live zebra! I hope Mr. Uday Kotak, the votary of excellence in corporate governance will take necessary steps to undo the misdeeds and the government will take deterrence action. The country will perish if such loot is tolerated! Yes I agree. Satyam was one-man ,one-company ghotala. This -in contrast-is effectively a criminal gang operating with devastating cunning -manipulating Company laws and eating up a prey (IL & FS) like a pack of hyenas. Cunning because Satyam did not have LIC, SBI,HDFC, ADIA etc as equity holders but this one had. And then packing with ex-IAS officers etc to act as liaison officers with the Governments -at the Centre and the States to get and then manipulate contracts !!!! Then the facade of a giant PSU (hence the AAA rating !!!!). Look at the salaries of the "directors"-twenty/thirty times that of a PSU like LIC,SBI !!!! If these guys do not go to jail, such things are surely going to be repeated. Absolutely. That's why they are hyenas! The crime is so big, they should spend rest of their lives in jail. can be recovered from the scoundrels and their heirs, benamis. 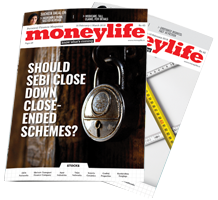 The risk of a counterparty's failure causing jump-to-default in Indian asset-backed security (ABS) transactions has been highlighted by the recent default of Infrastructure Leasing and Financial Services (IL&FS), a large Indian non-bank financial institution (NBFI), says a ratings agency. In a release, Fitch Ratings, says, "IL&FS was not itself a counterparty to any internationally rated ABS notes, but NBFIs act as the originators and servicers for most Indian ABS transactions, including those rated by us." The failure of IL&FS has significantly undermined market sentiment towards the Indian NBFI sector and their ABS issuance, the ratings agency says, adding, transaction flow has stalled and we have observed a rise in yields on the securitisation notes of NBFIs. The underlying asset performance of Indian ABS pools rated by Fitch remains sound. 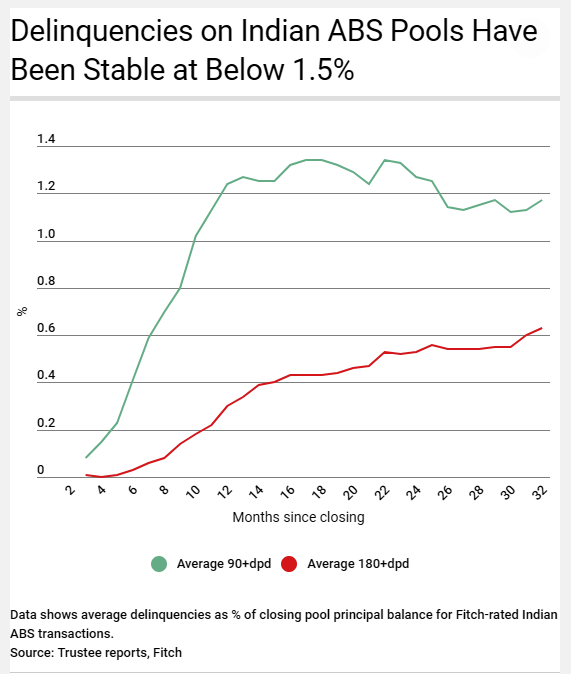 Overall, it says, delinquencies for Fitch-rated ABS transactions have remained stable at below 1.5% on average (see chart below), but performance varies according to the originator and the underlying asset class. Fitch has to date capped ratings on Indian ABS transactions at 'BBB-(sf)' in line with the account bank replacement rating triggers of 'BBB-'. Fitch says it typically does not assign an Indian ABS transaction a 'BBB-(sf)' rating unless its account bank has a rating of at least 'BBB-'. "The rating of the ABS is linked to that of the account bank as credit enhancement for ABS transactions in India typically comes in the form of a cash deposit with one or more financial institutions. This means that the failure of the deposit bank would wipe out the vast majority of credit enhancement available to note holders and therefore could significantly undermine a transaction's CE and its rating," Fitch added. According to the ratings agency, prolonged and severe stress of a transaction's servicer can disrupt collections on the underlying assets, undermining liquidity. In such an event, a transaction's liquidity coverage is usually relied upon to avoid a direct negative impact on transaction performance, it added. Fitch says it considers mitigation of servicer continuity risk to be a critical element of structured finance ratings. It says, "All Fitch rated Indian ABS transactions have liquidity coverage of at least three months, which reflects our expectation that this length of time could be needed to replace a servicer in a stress scenario. This liquidity requirement increases in cases where we believe servicer continuity risk is particularly high or that the servicer replacement time is likely to be longer." The ratings agency feels that inadequate mitigation of servicer continuity risk might lead to a cap on the ratings of notes. Recently, Fitch says it declined to rate transactions that did not have sufficient liquidity coverage, which could have led to excessive dependence on the unrated servicer and potentially exposed senior notes to jump-to-default or severe downgrade risk upon jump-to-default of the servicer.